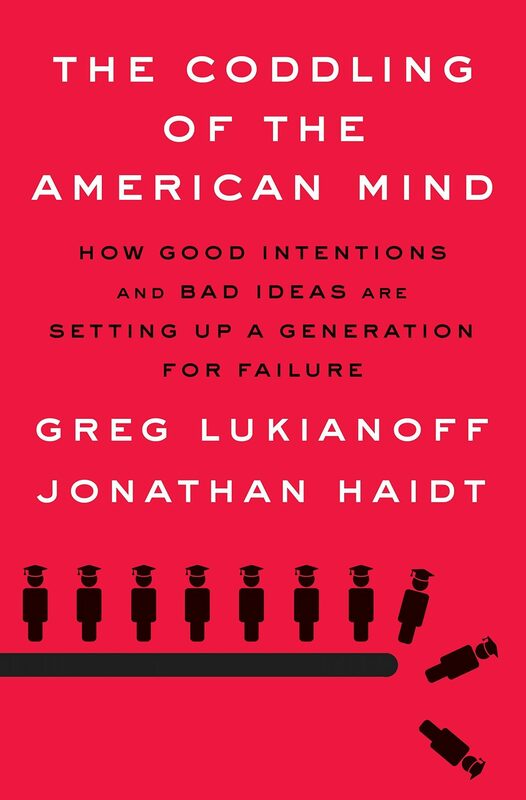 With apologies to my Southern Baptist friends, I recommend readers here consume The Coddling of the American Mind: How Good Intentions and Bad Ideas Are Setting Up a Generation for Failure like a good bourbon. Drink it too quickly and you’ll only get an irritating burn. Sit with it a bit longer, and you’ll discover a more flavorful nuance. Greg Lukianoff and Jonathan Haidt wrote Coddling as an expansion of their 2015 Atlantic article. They critique the climate of higher education and examine factors contributing to that climate. There’s plenty of burn in Coddling, including legitimate concerns about challenges to free expression on campus, like violent protests at Middlebury, Berkeley, and Evergreen. Lukianoff and Haidt also highlight less-known examples of stigmatizing and silencing, like the skewering of untenured philosophy professor Rebecca Tuvel for an article that provoked her disciplinary gatekeepers. We might also worry about more subtle pressures. As a tenured professor, I have a great deal of latitude to speak my mind and share my opinions. But I’ll admit there are some issues I don’t bother raising, because the predictable outrage isn’t worth enduring. The academy falls short of its own aspirations more than it should. Still, readers shouldn’t content themselves with the burn of Coddling. The real payoff will come for those who linger for the nuance. We owe part of that nuance to the authors’ perspectives. Lukianoff and Haidt combine a wealth of knowledge and experience in and out of higher education. Haidt is a social psychologist whose book The Righteous Mind [read TGC’s profile of Haidt: ‘An Unlikely Ally’: What a Secular Atheist Is Teaching Christian Leaders] remains a must-read for anyone concerned with increased political polarization. Lukianoff is a lawyer who directs the Foundation for Individual Rights in Education (FIRE), which defends speech and expression on college campuses. Coauthored books don’t always work well, but in this case the authors’ blended expertise enhances their argument. Penguin Press (2018). 352 pp. $28.00. Something has been going wrong on many college campuses in the last few years. Speakers are shouted down. Students and professors say they are walking on eggshells and are afraid to speak honestly. Rates of anxiety, depression, and suicide are rising. How did this happen? First Amendment expert Greg Lukianoff and social psychologist Jonathan Haidt show how the new problems on campus have their origins in three terrible ideas that have become increasingly woven into American childhood and education: What doesn’t kill you makes you weaker; always trust your feelings; and life is a battle between good people and evil people. It would be hard to overstate the significance of social justice to the formation of many of today’s college students. People can reasonably disagree about the scope and significance of any particular issue or event from the last decade. But the aggregation of these issues, amplified by a constant barrage of social media, is part of the deeply formative, lived experience of most undergraduates. It would be hard to overstate the significance of social justice to the formation of many of today’s college students. Lukianoff and Haidt helpfully critique vague invocations of justice-sounding words that too often mask contestable policy preferences. Christians should strive for clear and careful thinking in our words and arguments, and we should recognize that not every claim of “victimhood as moral theory” comports with a biblical framework. But Christians should also realize that some social justice aims are entirely consistent with gospel aims, such as addressing the ongoing costs of generational and structural injustices against people of color and recognizing the power dynamics and groupthink that too often underlie membership in a comfortable majority. And this is where I most appreciate Lukianoff and Haidt’s effort toward nuance. They recognize that the problems in higher education aren’t entirely due to systemic and structural injustices, but neither are they simply the result of progressive assaults on free speech. One need not agree with every Slate and CNN story on Ferguson, #MeToo, and gay rights to recognize that the modern university isn’t exactly an idyllic haven for students of color, women, and LGBTQ students. Campus communities, much like the broader communities that surround them, are complex social environments. We will only begin to address their shortcomings when we can accurately name those shortcomings in all of their complexity. I worry that some of this complexity will be lost if Coddling is read through a certain conservative Christian lens. My sense—and I would gladly be proven wrong—is that this lens will amplify Coddling’s free speech anxieties and downplay its social justice concerns. That kind of oversimplified narrative leads too many Christians to conclude that the “secular university” is beyond repair—a place where Christian faculty hide in anonymity and where Christian kids go to lose their faith. To be sure, I know of Christian faculty who have faced serious challenges from their institutions. I know of Christian students like Isabella Chow who have been vilified by their peers. And I’ve witnessed bigotry against Christians by university faculty and administrators that wouldn’t be tolerated against any other demographic. These are serious problems, and they need to be addressed by Christians and non-Christians alike, including people like Lukianoff and Haidt. But it would be a mistake to conclude that they define the university. I teach at what is by any measure a fairly liberal and secular university. I teach courses in criminal law (including classes on sexual assault and police shootings) and law and religion (including classes on Hobby Lobby and Masterpiece Cakeshop). These aren’t uncontroversial topics. And I teach these classes to bright students who are ideologically, religiously, and racially diverse. In my experience, most students are ready to engage in these issues with rigor and charity. I don’t start my classes with a group prayer or a Gospel reading, but neither do I hide my Christian commitments from colleagues and students—I am, after all, writing for a review for The Gospel Coalition. And it turns out I’m not alone. Washington University has dozens of Christian faculty across a range of disciplines, some of whom have joined me to launch a new ministry called The Carver Project. You can also find Christian faculty at places like Harvard and MIT, Duke, Berkeley, Yale, and many other schools. Meanwhile, campus ministries and Christian study centers are flourishing around the country. Like bourbon and books, institutions and people are usually more complex than our first impressions of them. Lukianoff and Haidt recognize the same is true of American higher education today, and Coddling captures the complicated landscape that includes both free speech challenges and social justice challenges, coddled students and courageous students, ideological extremism and principled conviction. These represent both challenges and also opportunities. Many Christians called to today’s colleges and universities will need to venture into unfamiliar and sometimes inhospitable places, to treat the people we encounter there as the image bearers they are, and to love even those who might not love us back. If we take those challenges seriously, we will discover a lot of nuance after the burn.